This topic contains 14 replies, has 8 voices, and was last updated by Voltair 3 days, 15 hours ago. Its been a while…. I have sad news to report. Our beloved Rampant was found sunk in her slip three weeks ago, only 3 days after we had a lovely Labor Day weekend aboard. I have been through quite a process since. Surveyor could find no smoking gun why she went down. Insurance co is covering the loss, but I have quite a dilemma. The company will sell her back to me for a pittance, but I do not have the stomach for all the restoration that is required. I would love to find a good home for her, someone who will work on her and get her to sail again, but I am not sure who it makes sense for to take on such a project, even for a very low investment. She is on the hard in Solomons, MD. There is a lot to work with. She was repowered in 2011 with a Yanmar 4JHE5, only 500 engine hours of Chesapeake Bay cruising since. Engine was pickled properly when she came out of the drink, and runs fine. But all the electrics are shot. She had new sails, winches, rigging etc. Lots of new hardware, inside and out. But the used boat market is full of low cost offerings. I know this is hard to hear for you all who love your Nic 38s. Its hard to tell the tale, believe me! My options are to donate, let the insurance co keep her, or try to sell her. Anyone have any suggestions to offer? I’d say try to sell it as a project. Its really only the electrics that are the problem. The insurance Co may well scrap it, which would be a shame. Charles – I’m just clutching at straws for you as to why Rampart sunk, so let me ask a couple questions. On your last sail, were you sailing hard on a port tack, putting the starboard bilge pump outlet below waterline? 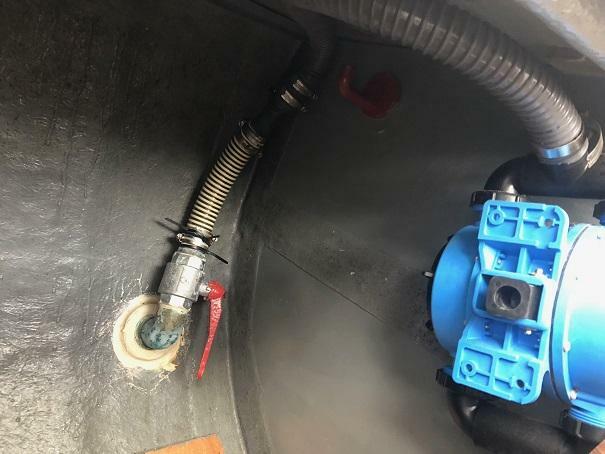 Do you have an automatic bilge pump connected to that outlet, without a check value to stop a siphon into the bilge when the outlet is below the water line? Others have taken on a lot of water from this siphon effect, but discovered the problem while still aboard. Does Rampart have the original cockpit drains that connect to the seacocks in the engine room without check valves? The cockpit sole is also very close to the waterline. Could it have been that you took on enough water while underway that the siphon continued after you departed, and eventually Rampart sunk? Even if a siphon is the not at fault here, it seems possible in the wrong circumstances. I think I will add “check bilge water level” to our disembarking check list. It would be sad indeed if she were scrapped. But I don’t have a solution for you. I’m sorry for your loss. Thanks for your thoughts and kind words. It is a sad time for us indeed. We hope that our loss will create an opportunity for another owner. When we were out for the weekend, the winds were light so we mostly motorsailed. We were not heeled over. Yes, we do have the original cockpit drains. I am not sure how we took on water. The bilge pump was tested later and found to work. It is truly a mystery how she sank. According to the marina, she was up in her slip in the evening, and then in the morning was on the bottom. I am sure it sends a shiver through every boat owner’s spine. We will need to float her and find out where, and if she still leaks. I have read carefully your post, being owner for a small year of TANGAROA. Would it be possible for Marilyn to have more explanation on this siphon problem. Is this a problem known for this type of boat and what do you advise to do? I would like to send you a picture of the cockpit so that you can tell me what you think…. – Topic which captures an email exchange that occurred before this website existed. 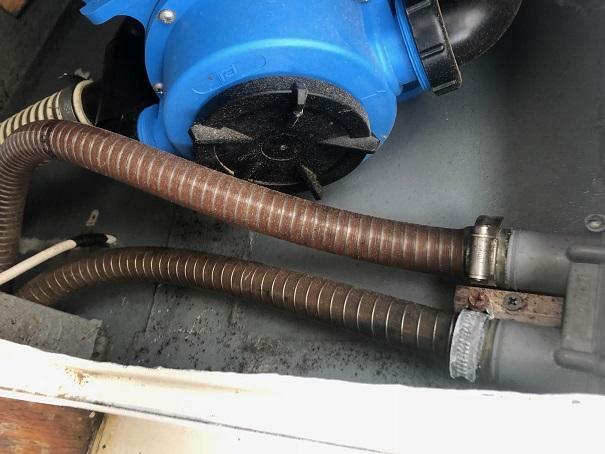 – if you have an bilge pump connected to the starboard bilge thru-hull, make sure the line has a check valve (or a siphon break) in it so water cannot siphoned back into the bilge after the pump shuts off when the bilge pump outlet is under water. This is a particularly sinister problem if you have an automatic bilge pump that will cycle on its own perhaps when you are not aware that it is running because you are having so much fun sailing hard on a port tack. 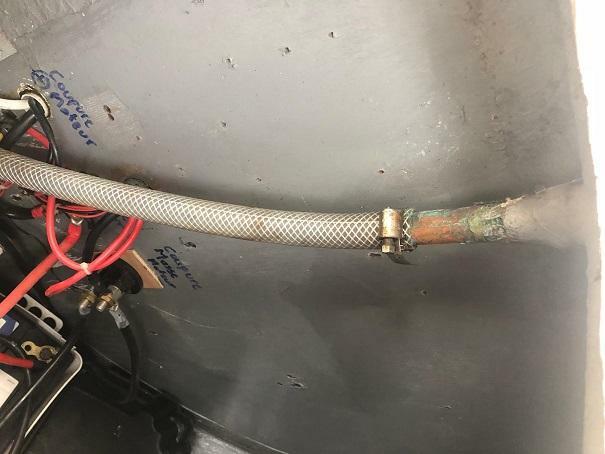 – if your cockpit drains are connected to the thru-hulls below the engine room, you probably need check valves on those to stop water surging back up the crossed lines. Alternatively, many owners direct the cockpit drain water into the bilge, and then pump it out. Hope that helps explain the problems better. Since you were motoring, it’s conceivable that the white metal bearing (bearing through which the prop shaft penetrates the hull to the transmission) may have opened up in such a way that it allowed water to flow in. Normally it’s adjusted to allow a drop of water every few seconds. If the nuts holding the stuffing box vibrated loose, I can imagine it letting in a stream of water that would eventually sink the boat. Yes, this story sends a shiver down my spine and makes me want to go check on Rainshadow as soon as possible. Hope you, Van and Rainshadow are well? I read your comment about, “check valves” in your cockpit drain pipes, when we were corresponding on that subject before, I don’t recall you mentioning them?! How effective are your cockpit drains, do they work while Rainshadow is stationary? I have read all your forums about this problem. I have a look on TANGAROA too and I think I will have to improve this system. What do you think about these photos. I have only one manual pump connected to the starboard bilge thru-hull. It seems that every cockpit drain water into the bilge. And I have an automatic pump, connected to the starboard bilge thru-hull. It is located Under the floor of the aft cabin. This one is out of service so I need a new one. Have you a good reference of pump to give me ? When you are sailing, do you cut the automatic pump ? I have read Marylin website on this subject and I have understand that you have created a new pump adjacent to the rudder post on the interior starboard side of the cabinet. I have not understand where it is located. Can you explain me. Have you a plan or photos ? Kari and Lawerence – to answer your question about our cockpit drains, we do not have check valves in our drains. The drain hoses are directed to the bilge, so we must pump overboard any water we take on. Rainshadow’s cockpit drains work acceptably for the amount of water we’ve taken on. During our passage from Seattle to Hawaii, we had many boarding waves from large following seas, some of which directed a few gallons of seawater into the cockpit. The water all seemed to disappear before we finished reacting to the surprise of being doused with cold seawater. Given the center cockpit arrangement, and the canvas that can be secured to protect the cockpit when needed (e.g. rain or big seas), it seems the Nic 38 cockpit doesn’t take on much water under normal sailing conditions. We’ve never been in a gale offshore, so cannot answer to that. But this strange arrangement of cockpit drains being directed to the bilge, and the small drain holes/hoses, has always left me somewhat apprehensive of how she would do in severe boarding seas. No one has ever commented on taking on water that caused a serious problem. Indeed, the only comment I remember came from Peter and family here. I am very glad to report that Hull #53 has been rescued by a fellow member of our Nic 38 group! I transferred ownership of Rampant and all of her gear to Nicholas Fairhurst earlier this month. I am confident that Nick will be an ideal custodian of Rampant, so I feel very fortunate that we have found each other, and I have this forum to thank! I look forward to seeing posts from Nick as he begins his restoration and recovery of Hull #53. Thankfully, our insurance company paid us out in full, and with the proceeds (and then some), my family and I have purchased another cruising sailboat. So this is the way my family’s 47 year relationship with Rampant comes to an end. But despite the tragic sinking, it is a happy ending! We will gain a newer boat more suitable to our cruising plans, and Nick will gain a vessel and project that he has fancied for some time. Let us all wish Nick and his family all the best so that they can return Rampant to sail again before too long. This happy conclusion to a sad event and how a really good organization with a wonderful person at it’s head can facilitate and perpetuate the enjoyment and learning that truly great vessels can help embody, in ourselves and our families, has been in evidence here. Once 100% seaworthy again #53 and our family at large will, I am sure, be renewing old and new cruising acquaintances from the ranks of this owners club and the great vessels that bring us together. I think Jeremy would be happy that his design team had helped facilitate a line of vessels that have establish a healthy global family cruising mindset in so many. Welcome to the “ohana” of fellow Nic 38 owners! I think you will find our family of fellow cruisers covers most of the world. Rainshadow sits in Hilo Bay, Hawai’i for now, but we plan adventures south and west of here soon. Two plus years of refitting is almost done….. While bringing #53 back to seaworthiness, don’t hesitate to ask for information, ideas, etc. Tons of knowledge and ideas here, even without Jeremy. And please let us know what you learn as you rebuild and repair! All removable interior doors,panels,shelves and sole boards are now removed and in dry storage. This has given me a clear line of sight for the wiring, plumbing, gas lines, tankage etc and as to what is located where and how, in order for me to draw up some schematics for future reference. The interior headlines are down in order to check for any deck hardware leaks and I am happy to report only one leak was evident on hose testing and now remedied. The bilges and hull interior have been cleaned and some areas reinforced with laminated gussets where the starboard saloon U berth/seating were lightly tabbed in, for extra rigidity on the turn of the bilge. 50% of the bilges are painted out whilst we had a warm spell and all the seacocks dismantled, serviced and new ABYC hose fitted where needed when it was too cold.As John commented, a audit of all the electrical systems has been the largest task but I am pleased to say the excellent installation and quality of fittings from the 2011/12 refit have minimized the damage to the wiring looms and terminals.I am working my way through the electrical equipment but the long term prognosis for most of it is not good – as one would expect. As I work systematically through the vessel I have not yet found a ” smoking gun” as it were.You mentioned the prop shaft stern gland, plenty of greasy packing in evidence and no appreciable play in the shaft.I will fit lock nuts and a remote grease cup but otherwise all good. In my professional experience a number of conspiring mechanical/ physical coincidences can result in a vessels bilge pumping system becoming over whelmed and my instinct leads me to this conclusion with #53 – but as life teaches us we can never relax on keeping our eyes and ears open… Murphy is a hard taskmaster ! Rather late to join the debate, perhaps, but cockpit drains were always an insoluble problem aboard Voltair… that is, until we decided to do away with them. The 5 cm of freeboard between cockpit floor and sealevel was always a worry, and was one of the reasons we never took Voltair across an ocean. One only needed a couple of cubic metres of water into the bilge, such as one might get if a big sea carried away the windscreen, the waterline lowers a couple of inches, and the drains become fountains, if you sail with them “on”. The pitifully small pipe diameters certainly were not going to clear a cockpit full of water! If one had an engine-room fire, the plastic pipes were quite possibly going to melt, and then “down she goes” if you aren’t quick to turn them off. We even discussed the idea of cutting port and starboard “letter-box” openings into the hull a few inches above the floor level, and letting cockpit water out that way, but it seemed a bit of a drastic experiment! So we turned them off at the end of our first season, and “off” they remained for the next 16 years!